Honey Boo Boo can add social media marketing expert to her long list of credentials. 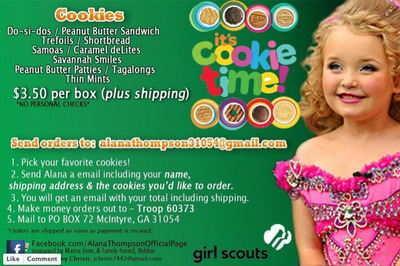 Apparently Alana Thompson is a girl scout on top of her pageant queen/reality star commitments. And since it’s cookie season, Thompson had to unload lots of thin mints — and fast. Entrepreneur that she is, Thompson is using her 700k Facebook fans to advertise her endeavours on her page. After less than two hours, her post was shared more than 100 times and received almost 500 comments — which isn’t a lot when compared to McDonald’s, but is a pretty good marketing move for a seven-year-old. And she probably didn’t even have to make it a promoted post. Alana and her family will also sign every $3.50 (plus shipping) box her fans buy.